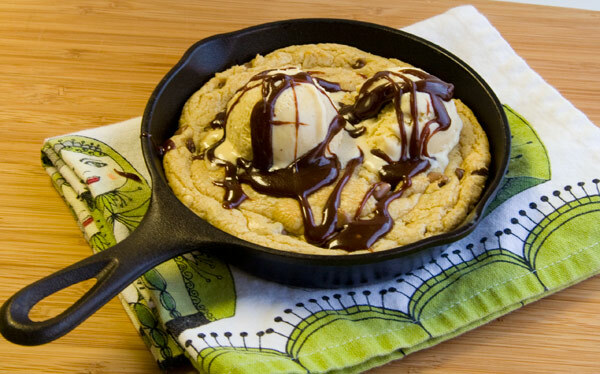 A few years back before my husband and I were married we both went to different dessert places (in 2 different states) and happened to both try these things called pizzookies (pizza cookie). He came back home and was raving about this ingenious idea and I concurred completely. Of course anytime I try something that is absolutely fantastic I have to try and create it myself. For my birthday that year he bought me 4 individual sized skillets. We have had pizzookies several times since then and I absolutely love them. 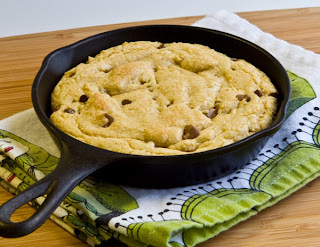 The "individual" sized skillets really are big enough that 2 or 3 people could share one (unless you really like sweets, which I do). 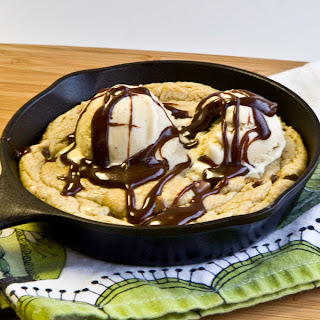 They really are so simple to make, and always a crowd pleaser! 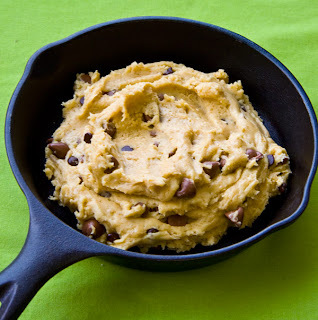 I usually have some left over cookie dough in the freezer that I have already shaped into cookie sized balls and am able to though a couple of those in my skillets and bake them up. They make a fun quick dessert. Lightly grease 4- 6 inch skillets is not already well oiled. Preheat oven to 375 degrees. 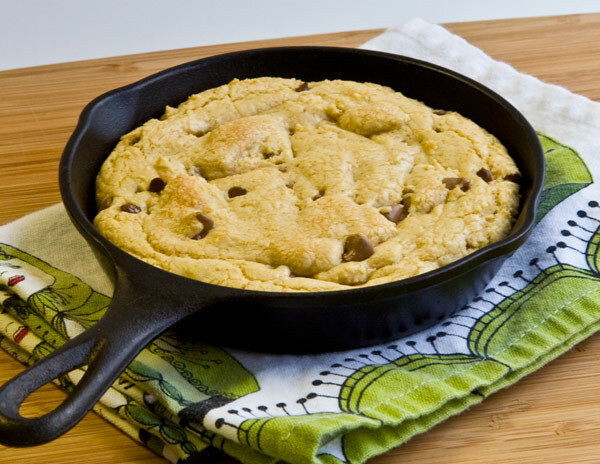 Press enough cookie dough into skillets to mostly cover the bottom. Place in preheated oven and bake for 12-15 minutes. Cookies should be slightly brown on the edges, but still look slightly gooey in the center. This is the way I like them, but you are welcome to bake them longer if you want them more done. Remove from oven and top with ice cream and hot fudge and caramel if desired. The idea of these are to be an ooey delicious mess. 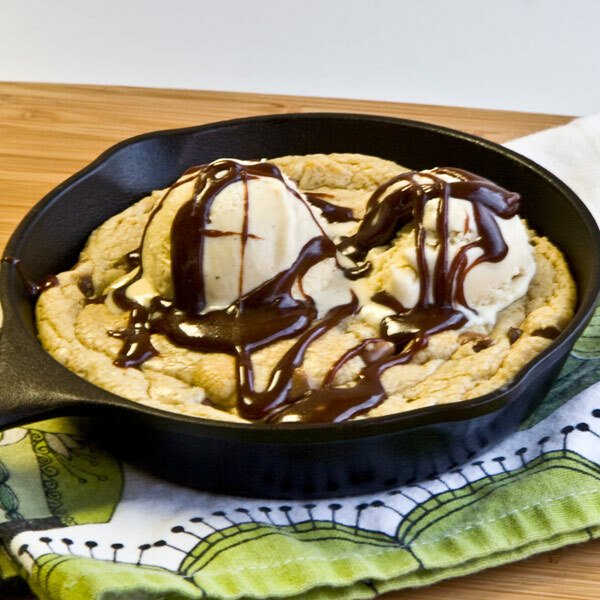 Be careful with the skillets as they will remain hot for a while. One skillet was more than plenty for 2 people to share. For smaller portions this could also be made using ramekins. Happy eating! Note: I often keep cookie dough in my freezer and just pull a few cookie dough balls and make these whenever my heart so desires. This is how it looked fresh out of the oven. Pre ice cream! The delicious finished project! The more the ice cream melts the more I love it! YUM. I cannot wait to try this one on a girls night in! !